This Victorian brass stamping is richly detailed. It is oxidized and then antiqued to enhance all of the intricate details. This stamping is from very old tooling, probably 1930/1940 era. Made in the USA! 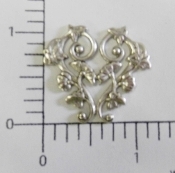 The piece is approximately 1-1/8" x 1-1/8".